تابش پور, محمدرضا, ملایجردی, ابراهیم. (1394). مروری بر کنترل ارتعاشات سازه‎‌های دریایی. مجله صوت و ارتعاش, 4(8), 101-105. محمدرضا تابش پور; ابراهیم ملایجردی. "مروری بر کنترل ارتعاشات سازه‎‌های دریایی". مجله صوت و ارتعاش, 4, 8, 1394, 101-105. تابش پور, محمدرضا, ملایجردی, ابراهیم. (1394). 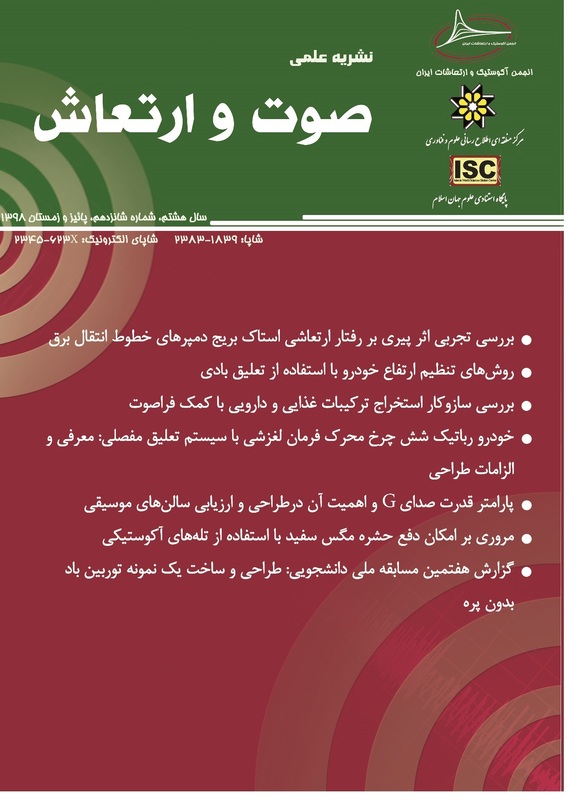 'مروری بر کنترل ارتعاشات سازه‎‌های دریایی', مجله صوت و ارتعاش, 4(8), pp. 101-105. تابش پور, محمدرضا, ملایجردی, ابراهیم. مروری بر کنترل ارتعاشات سازه‎‌های دریایی. مجله صوت و ارتعاش, 1394; 4(8): 101-105. امروزه با افزایش میزان استفاده از سوخت‌های فسیلی و محدودبودن این انرژی در خشکی، نیاز به استخراج از بستر دریا روزبه‌روز افزایش یافته و موجب توسعه و رشد قابل توجه سازه‌های فراساحلی شده است. این سازه‌ها معمولاً در معرض ارتعاشات ناشی از بار‌های محیطی‌اند که سبب کاهش عمر خستگی آنها می‌شود. رویکرد نوین در طراحی سازه‌ها، استفاده از سازوکارهای کنترل به‌منظور کاهش اثر بارهای محیطی بر آنهاست که به‌تدریج در کنار روش‌های سنتی - که صرفاً مبتنی بر افزایش مقاومت سازه‌ها بوده‌اند - مطرح می‌گردد. عملکرد وسائل اتلاف انرژی تقریباً مشابه هم است و همگی انرژی جنبشی را به گرما تبدیل می‌کنند. در این مقاله، نخست به معرفی انواع میرایی، سازوکار کنترل و میراگر و معادلات حاکم بر آنها پرداخته شده است. سپس روش‌های کنترل به‌صورت تفصیلی بیان شده و براساس نوع کنترل غیرفعال و فعال در سکو‌های ثابت و شناور پژوهش‌های انجام‌شده مورد بررسی قرار گرفته است. در انتها دو مطالعة موردی که به مقایسة سیستم‌های کنترل غیرفعال در سکوی‌های فراساحلی پرداخته‌اند، بررسی شده است. Soong, T. T., G. F. Dargush, Passive Energy Dissipation Systems in Structures Engineering, John Wiley & Sons, 1997. Symans, M. D., Seismic Protective Systems, Rensslaer Polytechnic Institute. Connor, J. J., Introduction to structural motion control, Massachusetts of Technology, Pearson Education, New Jersey. Weber, F., G. Feltrin, O. Huth, Guidelines for Structural Control, Structural Engineering Research Laboratory, Swiss Federal Laboratories for Materials Testing and Research Dübendorf, Switzerland, 2006. Atreya, A., S. Hati, S. Chatterjee, P. V. Vishnu, N. Agrawal, M. Singh, M., Structural Dampers, 2013. Miyamoto, H. K., R. D. Hanson, Seismic Dampers.Structural practices, 2004. Vandiver, J. K., S. Dargush, Effect of Liquid Storage Tanks on the Dynamic Response of Offshore Platform, Department of Oean Engineering, MIT. Patil, K. C., R. S. Jangid. “Passive control of offshore jacket platforms.” Ocean Engineering 32 (16), pp. 1933–1949. Jingping. O., X. Long, Q. S. Li. “Vibration Contorol of steel jacket Offshore Structures with Damping Isolation Systems.” Engineering Structures, 2007. Qiao, J., X. Li, N. Sun, J. Guan. “Experimental and Numerical Study on Tuned Liqued Dampers for Contorolling earthquake Response of Jacket Offshore Platform.” Marine Structures, 2007. Zhang, L., Q. J. Yue, W. S. Zhang, C. Hsiao. “Experimental study on mitigation of ice-induced vibration for offshore platforms with a tuned mass damper.” Engineering for the Maritime Environment, 2008. Golafshani, A. A., A. Gholizad. “Friction damper for vibration control in offshore steel jacket platforms.” Journal of Constructional Steel Research, 2009. Rujian, M., A. Haiting Zhang, Z. Dong. “Study on the anti-vibration devices for a model jacket platform.” Marine Structures, 2009. Komachi, Y., M. R. Tabeshpour, Golafshan. “Retrofit of Ressalat jacket platform (Persian Gulf) using friction damper device.” Physics & Engineering, 2011. جانبازی، حسین، محمدر‌ضا تابش‌پور. "بررسی چیدمان بهینه میراگر ویسکوز در سکوی ثابت دریایی تحت بارگذاری تصادفی موج در حوزه فرکانس"، شانزدهمین همایش صنایع دریایی، 1393. BISWAL, K. C., S. K. BHATTACHARYYA., P. K. SINHA. “Free-Vibration Analysis of Liquid-Filled Tank with Bafflese.” Journal of Sound and vibration, 2003. Lee, H. N., S. H. Wong, R. S. Lee. “Response mitigation on the offshore floating platform system with tuned liquid column damper.” Ocean Eng, 2006. Srinivasan Chandrasekaran, Ranjani Ramanathan. Dynamic Response of Tension Leg Platform with Tuned Mass Dampers.” Journal of Naval Architecture and Marine Engineering, 2013. Lee, H. N., H. H. Juang. “Experimental study on the vibration mitigation of offshore tension leg platform system with UWTLCD.” Smart Structures and Systems, 2011. Rosane, M., C. RonaMo. “Active/Passive Control of Heave Motion for TLP Type Offshore Platform.” International Offshore and Polar Engineering Conference, 1999. Wang, H. H. “Optimal Vibration Control for Offshore Structures Subjected to Wave Loading with Input Delay”, International Conference on Measuring Technology and Mechatronics Automation, 2000. تابش‌پور، محمدر‌ضا، یونس کماچی. "به­کارگیری مهاربند­های کمانش‌نا­پذیر در اعضای قطری سکو­های دریایی به‌منظور بهسازی آنها"، پنجمین همایش ملی صنایع فراساحل،تهران، دانشگاه صنعتی شریف، 1392. Golafshani, A. A., A. Gholizad. “Passive Devices for Wave Induced Vibration Control in Offshore Steel Jacket Platforms.” SCIENTIA IRANICA, 2009.